I’m on my way up to the mountains with my husband and two young daughters. It’s early. Still a bit dark. That’s how it is this time of year – January, on the other side of the winter solstice, and yet not very far from the shortest, and darkest, day of the year. That’s how it is when we must wake up to be among the first to hit the slopes for a family ski day at our nearby mountain resort. I grumble throughout the drive. I’m not a morning person. This is too early for me. I’m not a fan of skiing anymore, either – not since I moved from Colorado and its pristine powder to Washington, where there isn’t always a promise of fresh snowfall. Last week, in fact, we skied in the rain, pelted with water that leaked through our goggles and drained into our eyes. My husband looks away from the road to flash a grin my way. He’s uncharacteristically jovial and energized, knowing we’re on the way to adventure. “This is going to be great,” he says as he taps his fingers on the steering wheel to the beat of whatever celebratory jingle is looping in his head. I grumble again and look the other way, out my dark passenger-seat window. He can’t hear what I’m saying. The grumble, more like a growl, is my cover for the profanities that yearn to spill out, though it doesn’t fully hide my upset and counterwill to his intense eagerness. I glance in the back seat at my girls. They’re listening to an audiobook, all cuddled up in a blanket they’re sharing. Yes, I actually wrote that: sharing. They’re not fighting, which is rare when they’re in such close proximity in an enclosed chamber such as our car. Clearly to my husband, and to my girls, skiing is all play. Whereas all I can think about is the Work. It’s Sunday. How late will we get back this afternoon? Will I have time to get all our outdoor gear dried off and washed? What about the rest of the week’s laundry I haven’t gotten to yet? The girls still have thank-you notes to write from Christmas. Their rooms need serious help, too. It’s as if their dolls, stuffies, and toys threw all-night parties throughout winter break. Come tomorrow morning, will we be fresh enough for school? What if the kids are too tuckered out? What if I am? What if dinner and bedtime run late tonight because of all this supposed fun? This is irresponsible, this ‘having fun’ business. Grrr. I mumble to the window again. Eighty minutes later, we arrive at the ski hill. We spend 20 minutes squeezed together in the minivan like wiggly breakfast sausages as the four of us shake and shimmy into our ski gear. Bundled up and bundling more, we steam up the windows with our hot breath. Why all these layers? I’m sweating my pits off as I help stuff my kids’ feet into their fuzzy ski boots. Once the kids are ready, I put on my balaclava. They didn’t have these things when I was my girls’ age. In theory, they’re a marvel of an invention – a thin layer of polyester to keep my head, ears, cheeks, and chin toasty and dry and still fit under my helmet (which we didn’t have when I was a kid, either!). But the packaging failed to issue a warning statement: If you have long hair, pulling your hair back is a must. As motherly luck would have it, I donated the last of the ponytail holders I scrounged up from the car’s cup holders to my daughters … none left for me. My hair underneath the balaclava is fanned out all medusa-like. Some of it’s going into my mouth or poking my nose, my eyes. It may be one of the most irritating things I’ve ever experienced. I can’t seem to get my hair to settle. The combination of static-prone polyester, the dry air, the fact that I didn’t bother to shower or brush my tresses this morning has made my hair a stringy mess. I will spend every chair lift ride throughout the day trying to spit the hairs out of my mouth, and after that approach fails, carefully removing my gloves to wedge my fingers up through my neck warmer, then underneath the balaclava to try and solve the problem. How can people with beards stand this? I wonder. My feet are claustrophobic. My boots, even though they’re brand-new – perhaps because they’re brand-new – feel like Medieval torture devices. I can’t move my toes. I’ve never been a toe-tapper, but knowing that I can’t tap them now is suddenly so restrictive I’m ready to scream. But I can’t. I am a Mom. Because I’m a Mom, I can’t act like the child I feel like inside – the one who wants to throw herself down in the slush for a full-on temper tantrum. I can’t do so right now, anyway, with my kids and their skis in tow. Instead, I coach my daughters along as we slide up to the chair lift. I hold on to their ski poles and let them squeeze my arm while they bumpily sit onto the chair. I fake a smile, even though I’m not fully confident getting on chair lifts, and am waiting for my youngest to slip and drag me under the chair with her. Thankfully, that doesn’t happen and before long we’re on our first run of the day. I can’t help myself. Another grumble escapes from my lips. The snow is crusty. My fingers are cold. It’s foggy up here. Another dratted hair in my mouth! This just isn’t my thing, I remind myself over and over. Then I look up to see my daughters. Eight and nine – they’re not babies anymore. Still, they look so little against the backdrop of the massive mountain before us, the tall evergreens flanking the ski run. The girls have been skiing since they were three. To my surprise, they’re getting pretty good! They’re also pretty darling in their new ski gear from their grandparents. (I’m reminded again about those thank-you notes we must get out!) 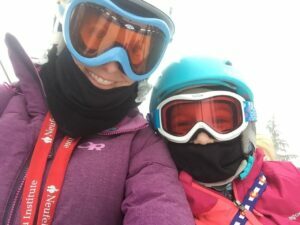 I’m enjoying watching my daughters and their comfort on the slopes … even if my slow, meandering style means I have to push myself to keep up with the new family pace. My youngest is eager to show me all her tricks. She keeps looking back at me, calling for me to check out her jumps, the way she squats down to help her speed up. She’s inviting me to play. She’s inviting me to see her, to know her. So of course, I have to accept the invitation! I also know I have to trump it. I don’t want her feeling like she has to pursue my affection. Just like that, my focus for the day switches from whining about my personal upset to getting ahead and relishing my daughter. After a couple of runs, it’s working. As one daughter pairs up with Daddy, my youngest and I partner together. We are having so much fun skiing as a team that we don’t notice the fork in the run, or that we’ve veered onto a different path from the other two. To meet back up with them, my daughter and I ski the rest of the way down the mountain and then ride a little two-seat lift together. The whole time, she’s smiling, laughing, and yakking my ear off. I delight in this time we’re sharing, these precious moments of connection. This little girl of mine is so sensitive, so easily wounded. The world wounds her. Sadly I wound her – no matter how developmentally educated I am, no matter my good intentions. Sometimes it’s as simple as choosing laundry over choosing her. She so easily shuts down. But today, even while dragging my boot-wearing feet, even if pressured by my overeager husband, I put the laundry aside, the Work aside, and finally, the work part of skiing aside. Instead, I choose my daughter. She feels it. I feel it. The difference it makes for her, for our relationship, is almost magical – even if it is Nature’s should-be-obvious design. I watch her defenses visibly melt away. Oh, yes. That’s right. This is why I ski, why I agreed to season passes, why I’ve succumbed to my husband’s vision of family ski excursions all winter long. It’s not about the ritual of skiing, but about the ritual of holding on to my kids. This is why I’ll return to the slopes with my family again next weekend. And the weekend after that. And the one after that … until, like my daughter’s defenses, the snow melts and growth springs forth. This is a reason to ski.